A jack is a mechanical device used as a lifting device to lift heavy loads or to apply great forces. A mechanical jack employs a screw thread for lifting heavy equipment. A hydraulic jack uses hydraulic power. The most common form is a car jack, floor jack or garage jack, which lifts vehicles so that maintenance can be performed. Jacks are usually rated for a maximum lifting capacity (for example, 1.5 tons or 3 tons). Industrial jacks can be rated for many tons of load. Shivam Patel ,one of our reader has uploaded report on hydraulic jack. 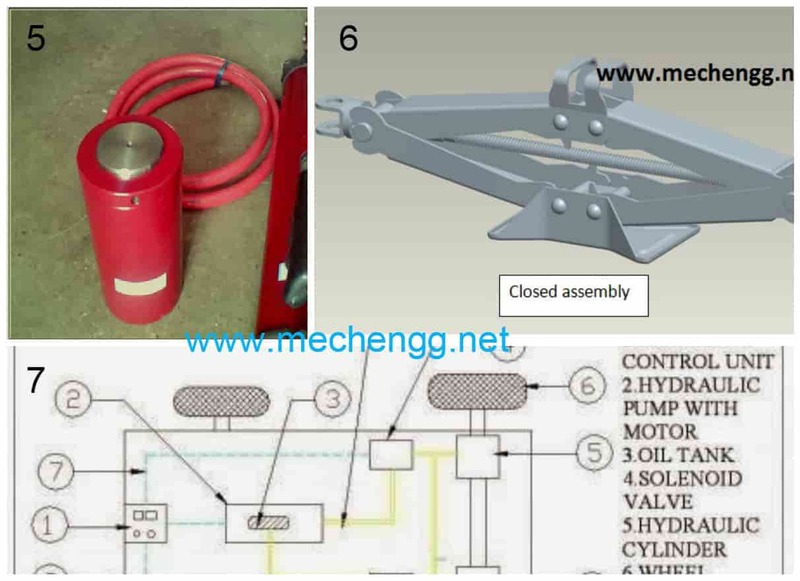 In report he covered introduction to Hydraulic, Principle Of Jack, How actually the system works, Detail design of hydraulic jack parts, Drawing of each hydraulic jack parts, Fabrication details , operational Sheet, and other important details are covered. This device the quick lifting jack with gear arrangement for automobile garages has been developed to later the needs of small and medium automobile garages, who are normally man powered with very minimum of skilled labors. In most of the garages the vehicles are lifted by using screw jack. This needs high man power and skilled labors. In order to avoid all such disadvantages. This, motorized hydraulic jack has been designed in such a way that it can be used to lift the vehicle very smoothly without any impact force. The operation is made be simple that even an unskilled labor can handled, by just demonstrating the working of the motorized hydraulic jack once. This project is modification of Hydraulic jack application . instead of hydraulics ,pneumatic system is used which saves total cost of project. This project is basically used for work piece positioning and then holding of the jobs firmly. two hydraulic cylinders are used for positioning and work holding of the project. Horizontal cylinder is used to operate movable jaws against fix jaw . In between these two jaws object can be hold. If Object is heavy then it can be lift by second Vertical cylinder ,the height of object can be adjusted precisely by controlling the quantity of the air or oil. Hydraulic Lifting Table is another modification of hydraulic jack principle. This project is mainly developed for lifting of four wheelers in a much better way. After placing the car in the ramp right above the lifting base, with the help of the scissors lift, the lifting base can be lifted; with which the servicing or repairing work can be done easily. The required components for this arrangement are Hydraulic bottle jack, scissors lift, platform, and cylinder with fluid. This equipment is suitable for all four wheeler vehicles.